Thanksgiving’s passed. Sick of pie yet? I’ve got the cure: Dr. Barbara Schwartz, who gave up a career birthing babies (she’s caught 3,000 newborns! ), turned to pie-making and in October took first place and “Best of Show” in Seattle’s annual Cake vs. Pie competition. Q: You gave up a longstanding career as an OB/GYN, learned to bake pies by watching cooking shows and reading cookbooks, and later talked your neighborhood restaurateur into selling them. So, any similarities between taking a bun from the oven and a pie from the oven? A: The joy that people experience when they make a pie for the first time is not dissimilar from handing somebody a newborn, but face it, the labor they go through is far less arduous. Also: it’s important to let the newborn and the pie rest after they come out of the oven. Q: What’s the single biggest mistake most pie-makers make? Q: What’s the best way to avoid overworking the dough? A: I use a Cuisinart. A food-processor is an extremely versatile piece of equipment. 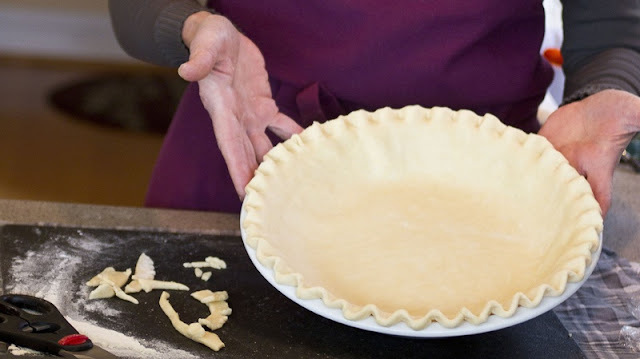 A 7-cup model can be purchased for less than $100, and it’s adequate for making a two-crust pie. That said, a pastry blender, or even a fork and knife, are sufficient for blending the fat into the flour — it just takes longer. Q: Speaking of: butter, leaf lard, shortening or a mixture? And what kind of flour? A: Leaf lard’s too porky-tasting for me. Shortening tastes like nothing. I use unsalted butter and all-purpose flour (not pastry flour or bread flour). 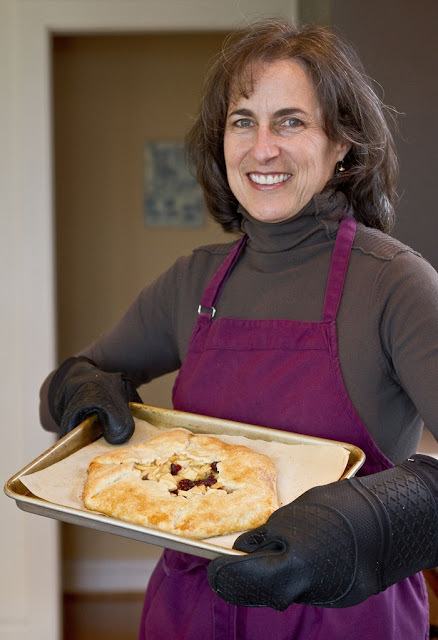 Q: I’ve been making butter-only pie crust in my Cuisinart for years, but yours is so much flakier. Now that I’ve watched you do it, I’ve learned what I’m doing wrong: waiting till it forms a ball! And what’s with that Saran Wrap maneuver? A: [Cuisinart or no], you want to only process your [flour/sugar/salt/butter/water] mixture till the butter’s still visible. Pea-size globules are what make the flake. Leave the mix at the crumb stage, and then it’s time for the magic trick: place a large piece of plastic wrap over the top of the Cuisinart bowl and flip the whole thing onto the counter. Carefully remove the blade, gather the corners of plastic wrap and cinch the crumbs, pushing in with your hands to make a beautiful solid dough-ball. Q: What’s the story with that little pastry board you’re so fond of. A: It’s a Dexas Midnight Granite Pastry Board. Nonstick, it measures 14-by-17 inches, costs about $15 and approximates the diameter of a pie crust rolled out to an 1/8-inch thickness. Because it’s polyurethane, it allows you to minimize the amount of added flour, which is really important. 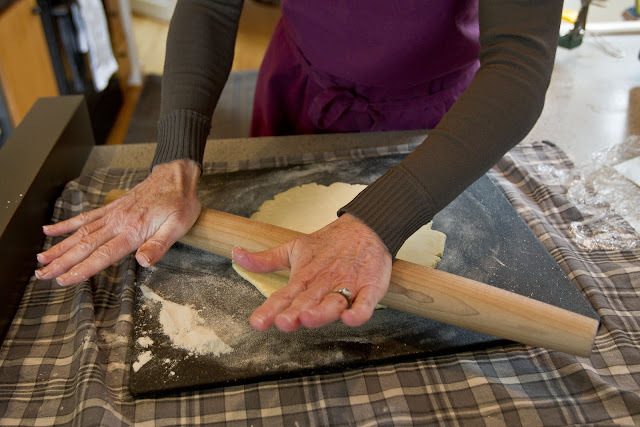 Q: You swear by your wooden French rolling pin. Why? A: The French tapered rolling pin, unlike pins with handles, lets me “feel” the dough underneath as I’m rolling it out, allowing me to target the area of dough I’m rolling: if one area’s thicker, I can use the small part of the tapered end to work on it. When rolling, always start from the center and move out — stopping shy of the edge so you don’t make the dough too thin or get that “cracked” look. 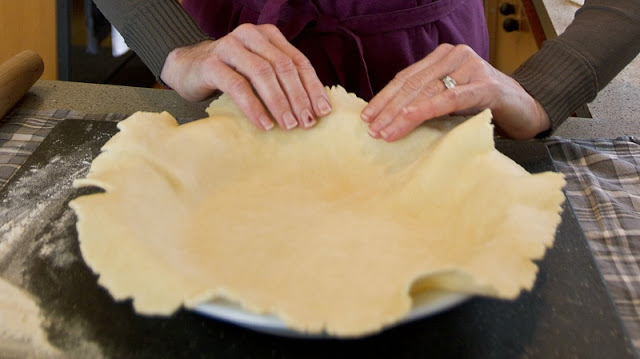 A: Dough has memory: it will shrink back, so when you transfer your crust into the pie plate, you want to gently place it and to get it into the “corners.” Lift it back and coax it in there, as opposed to pushing it down. Q: If Simple Simon stopped you and said, “Making a pie scares the yell out of me, but I really want to try to make one” what would you tell him? A: Don’t be scared! 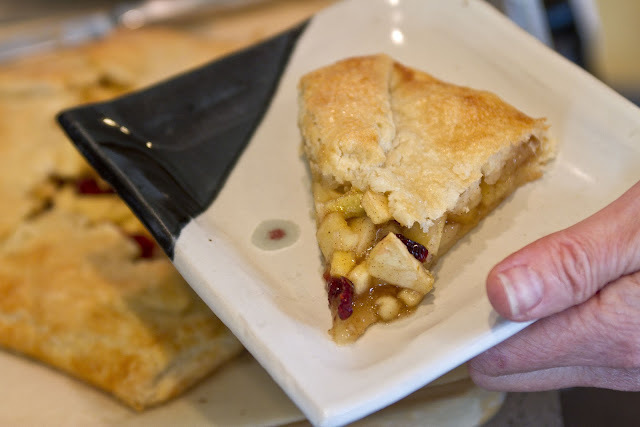 Now that you’ve learned a few simple pointers about making a crust, make my apple and pear galette [you’ll find that recipe right here]. It’s easier than making a pie, rustically beautiful and just as delicious.